NASA administrator Charlie Bolden at NASA's Fiscal Year 2012 budget briefing on Monday, Feb. 14, 2011 at NASA Headquarters in Washington. WASHINGTON – NASA is on track to send humans to Mars, the space agency's chief said Wednesday (April 6). Addressing an auditorium full of scientists, industry members, educators and former astronauts, NASA Administrator Charles Bolden said the agency committed to a future manned mission to Mars, and that the International Space Station is a vital test bed for getting there. "The International Space Station is the centerpiece for our human exploration and our spaceflight endeavors in the coming decade," Bolden said. "I like to say it's our anchor for the future of human exploration. The station is our start to the journey outward." Bolden delivered the keynote address at the International Space Station and Mars Conference, a two-day event held here at George Washington University. The International Space Station is the largest human-built structure ever constructed in space, and is the product of cooperation between five different space agencies representing 15 countries. Constructon of the $100 billion orbiting lab began in 1998. NASA completed its parts of the space station last month, with Russia's Federal Space Agency planning to add at least one more large laboratory module sometime next year. NASA and its partners plan to keep the space station operating through at least 2020. "Over the next 10 years, we'll continue to collaborate with other nations to live and work together in space, and perform cutting edge research and technology demonstrations that are critical to our eventual exploration into deep space with humans," Bolden said. "The ISS is the most realistic analog we have to test life support and other technologies, ensuring they function in space, and most importantly, that they are reliable." In addition to the scientific and technological lessons the space station might offer, the orbiting lab also represents an ongoing successful cooperation between different nations toward broad and unifying goals, Bolden said. And this collaboration will likely act as an important precedent for future missions to Mars, NASA's chief said. 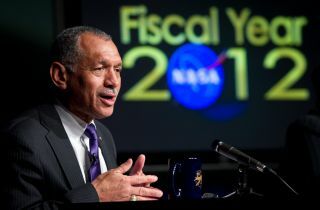 "Any mission to Mars is likely to be a global effort," Bolden said. "The ISS is a blend of goals among the participating space agencies, and it is truly beautiful in that regard alone." Bolden described the years ahead as an incremental journey to the Red Planet, and claimed that the stepping stones of the program could serve as inspiration for a whole new generation. As he spoke about his vision for the future, the former astronaut's voice welled with emotion. "I know my granddaughters will be witnessing humans arriving at Mars," Bolden said. "Like the President, I believe such a journey is possible in my lifetime. But what I know today is that we have an amazing engineering resource in space right now – the International Space Station. And we're moving out on the innovation and technological breakthroughs that are required to get us to our neighboring planet."